A writer in California describes what it was like to watch the attack on the voting-rights marchers on television. 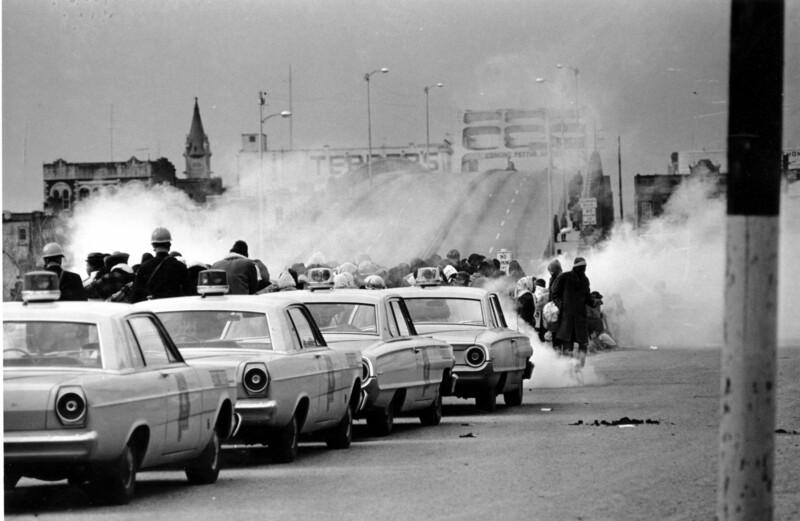 State troopers attack protestors on the Edmund Pettus bridge in Selma, Alabama, on March 7, 1965. Photo via Associated Press. Fifty years ago today, Alabama State Troopers attacked voting-rights demonstrators on the Edmund Pettus Bridge in Selma. Events moved quickly after that, with President Lyndon Johnson delivering his “We Shall Overcome” address before Congress and calling for a voting-rights bill just over a week later. But in early May, The Nation circled back to that moment on the bridge, with an essay by the California writer George B. Leonard, who watched footage of the assault at home. Shocked and appalled by what he saw, Leonard (originally from the South) took a plane to Selma to be there for whatever would happen next. His essay, “Midnight Plane to Alabama,” appeared in The Nation of May 10, 1965.